That's a long title!!!! 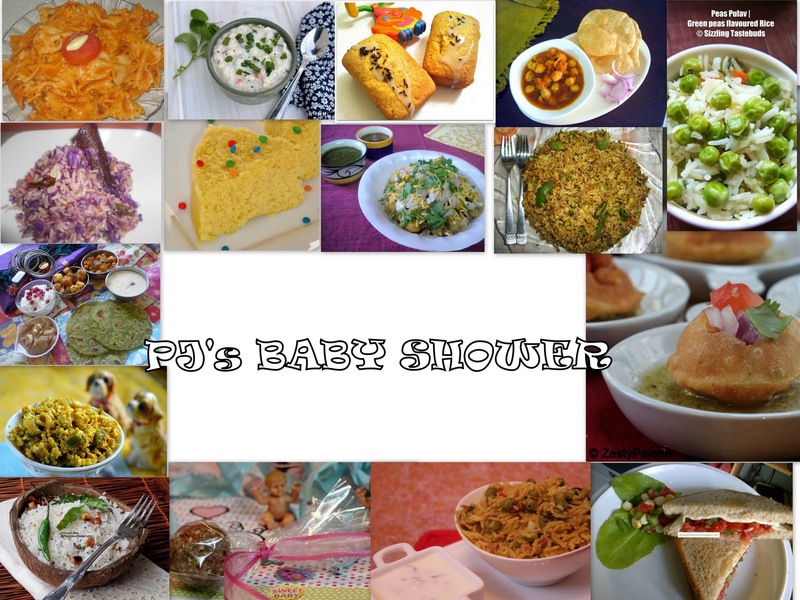 Thats is fine, coz this is an Extra Special Post as we are hosting a Virtual Baby Shower for our Blogger Buddy PJ of Seduce your taste buds. When we decided to a Virtual Baby Shower, we first thought of cooking something that would interest her now or some interesting Kid's Recipes. After some discussion we all agreed to Cook something from her blog and post. Now, this became even more tough choice, she has an amazing collection of recipes and to decide on one was very tough job!! So, i ended up Cooking 6 dishes from her blog and decided to do this as two post instead one. Hope this little gesture of us, brings a broad smile on her face and makes her Happy!!!!! Here is a Big Shout from all of us PJ, Have a Safe Delivery and God Bless!!!!!! Blanch the Palak and MAke a Puree of it with yoghurt and Cumin Seeds. Take the Wheat Flour ina Wide Vessel, add the palak-yoghurt puree to it, add salt and make Soft chapathi dough. Divide the dough into equal-sized balls. Roll them out as discs and Cook them on a Hot Tava on both the sides. Serve Hot with any Side-dish of your choice. Soak Chana Dal overnight and Pressure cook it next day with enough water and salt. Heat oil in a Pan, Add Onions and saute till translucent. Take it off the stove and let it cool. Grind the onions, along with ginger, garlic and green chilli to a fine paste. Heat some more oil in the same pan, Add cumin seeds,let it crackle, add the ground paste to it and saute till gives out a good aroma and oil separates. Add tomato puree and 1 cup of water. Add all the masala's and mix well. When the rawness of the masala's escape, add pressure-cooked chickpeas and mix well. Adjust salt. Let it sit for 10 minutes, in a simmer flame. Garnish with coriander leaves and Serve hot with Roti's. Beat together curd,besan with 2 cups water.Add turmeric powder, green chilli, sugar and salt.Mix well. Heat a pan with this mixture and bring it a boil, simmer flame and let the liquid thicken. Meanwhile, heat a small pan with oil and put in the ingredients for tempering. Remove from heat and serve garnished with coriander leaves. 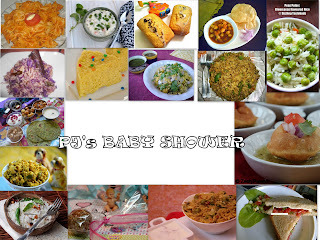 Yummy collection of recipes from PJ, very delicious. Take care PJ. Omg, u rock Priya..wat a fabulous spread, PJ surely gonna be very much excited and happy to see all our posts especially yours.. Wonderful recipes and a brilliant baby shower gift. That's a wonderful post Priya..so sweet of you to cook so many dishes!